The lovely Silvery Blue arrived in Massachusetts in the early 1990’s, moving south from New Hampshire and Vermont. It was first reported in Tewksbury, Essex County, on June 7, 1992, by Robert Godefroi. In 1993 it was found in northern Berkshire County by M. Fairbrother and in Gloucester by D. Savich and C. Leahy (Lep.Soc. Seas. Sum. 1991-93). Our butterflies are usually designated as subspecies Glaucopsyche lygdamus couperi, or Northern Silvery Blue (Pelham 2008). The nominate subspecies, G. l. lygdamus or Southern Silvery Blue, is based in the southern Appalachian mountains, and has apparently been withdrawing from the northern edge of its range, since it is no longer found in New York. G. l. couperi, on the other hand, has been expanding southward along highway corridors, feeding on introduced cow vetch and crown vetch (Dirig and Cryan 1991; Cech and Tudor 2005). Northern Silvery Blue (G. l. couperi) has only recently entered northeastern United States, and its movement southward has been dramatic. It was first found in Maine in 1967, and then in northern New York by Dirig in 1984, northern New Hampshire in 1986, and northern Vermont in 1987 (Dirig and Cryan 1991). It was finally recorded for the first time in Connecticut during the 1995-99 Atlas (O’Donnell et al, 2007). The most recent eastern North American distribution maps may be found in Opler and Krizek (1984); Cech and Tudor (2005), and Layberry (1998). Northern Silvery Blue is found in meadows, roadsides, and open areas within woodlands. However, it probably will not persist in fields that are mowed more than once or twice a year. Dirig and Cryan observed Northern Silvery Blue always in association with introduced Vicia cracca, or Cow Vetch, and noted egg-laying on it. This robust vetch thrives in sunny, disturbed habitats, including roadsides, and has been widely naturalised from Europe throughout eastern United States. Northern Silvery Blue is also reported to use veiny pea vine (Lathyrus venosus), non-native white sweet clover (Melilotus alba), and non-native alfalfa (Medicago sativa) in Maine, Michigan and Canada (Opler and Krizek 1984; Layberry 1998). Larvae have been found on beach pea (Lathyrus japonica) on Cape Breton Island (Layberry 1998). 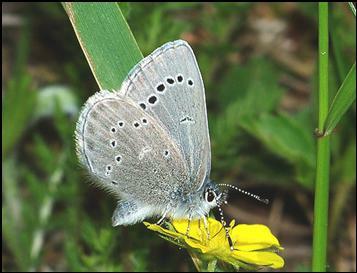 In Massachusetts, adult Silvery Blues have been observed in association with vetches (particularly cow vetch), with beach pea, and most notably, with crown vetch. The largest known concentration of Silvery Blues in Massachusetts has been Delaney WMA in Stow, where the only apparent host plant is a large planting of crown vetch (Coronilla varia), a non-native hybrid vetch widely planted to control erosion (Stichter 2005). A photograph of Silvery Blues engaging in mating behavior on crown vetch at this site ( 5//28/2006, F. Model) can be seen at http://www.flickr.com/photos/fsmodel/4421140948/in/set-72157623464167641/ . Cow vetch and other vetches used by Northern Silvery Blue are common in Massachusetts, as is beach pea along the coast. The great majority of vetches and lathyrus species in the state today are introduced species (Sorrie and Somers 1999; McGee and Ahles 1999). However, this is not a barrier to their use by Northern Silvery Blue. In one field in Gloucester in the 1990’s, the only apparent host was garden lupine (Lupinus polyphyllus), another introduced species (Sorrie and Somers 1999). After 1998, when these plants were removed by looters, the butterfly was no longer found at this site. Assuming Northern Silvery Blue has been in North America since the glacial era, then it has obviously adopted quite a number of more recently-introduced non-native legumes in addition its original native hosts. Northern Silvery Blue is therefore listed among the Switchers on Table 3, which shows the many butterflies which have successfully adopted new non-native hosts and thus increased their numbers and range. The southern race of Silvery Blue appears to be somewhat more specialized. Its main larval host plant is reported to be the native Carolina vetch (Vicia caroliniana), though Allen (1997) says that in West Virginia it also uses the native veiny peavine (Lathyrus venosus). These two legumes are not common in Massachusetts and may not even occur here, although many similar species are present (McGee and Ahles 1999; Sorrie and Somers 1999). As for habitat, at the northern end of its range, in south central New York, the southern race of Silvery Blue had been found specifically on shale barrens until 1967-8 (Dirig & Cryan, 1991), but in West Virginia its preferred habitat is damp woodland openings and fields near woodlands (Allen 1997). The eggs of Silvery Blue are laid on the flower buds, and young larvae feed on the flowers of the plant as well as the leaves. Their single brood, in late-May through early June, is therefore synchronized with host plant flowering (Layberry 1998; Dirig and Cryan 1991). MBC sight records from 2000-2007 rank Silvery Blue as Uncommon-to-Common in the state (Table 5). It is not nearly as frequently seen as the Spring Azure, or the Spring, Summer, and Cherry Gall Azures combined, or the Eastern Tailed-Blue, all of which rank as Common in Table 5. The 1986-90 MAS Atlas found no Silvery Blues; as mentioned the first individual was found in the state in 1992 in Tewksbury, at the beginning of the MBC recording period. The next year, 1993, it was documented in Gloucester on May 30 by D. Savich and C. Tibbits, and in Adams in June by M. Fairbrother (Massachusetts Butterflies No. 2, 8/93). The broad trend of MBC sightings over the 1992-2009 years has been upward, despite significant fluctuations (Chart 37; linear regression shows significant upward slope). Despite the overall increase, the chart shows a sharp decline in Silvery Blues between 2005 and 2008, and although numbers rose again in 2009 they fell slightly in 2010. However this statewide graph largely reflects the fortunes of a single, large, much-visited colony at Delaney WMA in Stow. Raw numbers counted at that site were between 80 and 100 each year 1999 through 2006, reaching 164 in 2005, but have declined sharply since. Statistics published in the Massachusetts Butterflies season summaries also show an apparent decline from the 2005 peak, but likewise suffer from over-representation of the Delaney colony. The average number of Silvery Blues seen on a trip was down 67% in 2007, 60% in 2008, then up 40% in 2009, and down again 13% in 2010, compared to the average for preceding years back to 1994 (Nielsen 2008, 2009, 2010, 2011). Analysis of 1992-2010 data using list-length as a proxy for effort showed a statistically significant 41% decline over these years (Breed et al. 2012), perhaps portending the longer-term fate of Silvery Blue in the state. 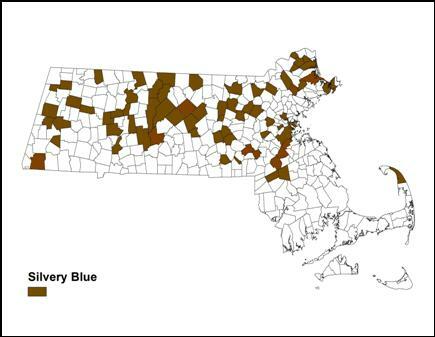 Silvery Blue was reported from 68 towns through 2013 (Map 37). The southernmost towns in the east are Easton and Mansfield – except for two reports of singles from Truro on Cape Cod. In its movement south, Silvery Blue has largely not reached most of southeastern Massachusetts or Cape Cod. Mello and Hansen (2004) do not list it for Cape Cod. MBC has two reports of singles in Truro, 5/14/2001 and 5/14/2002, but more reports from Cape Cod would lend credence to these earlier reports. The only blues found on Martha’s Vineyard and Nantucket, today or historically, are the three Azures and Eastern Tailed-Blue (Jones and Kimball 1943; Pelikan 2002; LoPresti 2011). There are likewise no reports from Plymouth County or southern Bristol County. The species has been fairly well distributed throughout the rest of the state, including north, south (Sheffield) and central Berkshire County. Silvery Blues are not usually found on NABA July Counts, owing to their May-June flight period. Individuals found on these counts would be at the very end of their flight period. Singles have occasionally been reported from the Northern Berkshire and Northern Worcester NABA Counts. Adams, max. 20 on 6/13/1994 Orland Blanchard; Adams Greylock Glen max. 5 on 6/2/2003 P. Weatherbee; Clinton Rifle Range, max.10 on 5/24/1998, T Dodd and C Asselin; Groton Surrenden Farm, max. 4 on 6/1/2008 T Murray; Holliston Brentwood CA, max. 5 on 5/31/2009 B Bowker; Holyoke max. 11 on 5/25/1998 R. Pease; Lenox Geo. L. Darey WMA, max.10 on 5/30/2008 F Model and E. Nielsen; Mount Greylock max. 5 on 6/13/2006 T. Gagnon; New Salem Prescott Peninsula, max 25 on 5/29/1998 D. Small; Northbridge max. 30 on 5/20/1998 D. Potter; Orange Tully Meadow max. 18 on 5/30/2004 C Kamp and A Mayo; Petersham North Common Meadow max 7 on 5/25/2009 T Gagnon et al, plus 6 at the Pump House; Pittsfield Berkshire Community College max.10 on 6/11/2002 Dolores Price; Princeton Wachusett Meadow WS max. 6 on 6/11/2006 S Moore and B Volkle; Royalston Tully Lake max 21 on 6/12/2006 C. Kamp; Sharon Moose Hill WS max. 4 on 5/24/2009 S. Jaffe; Stow Delaney WMA numbers between 80 and 100 in 1999 thru 2006, max 164 on 6/6/2005 E Nielsen, recent high 27 on 5/19/2012 T. Murray; West Newbury Cherry Hill Res. max 14 on 6/7/2008 E Nielsen; Williamsburg Graves Farm max. 9 on 6/03/2005 B Benner; Windsor Moran WMA, max. 19 on 6/11/2008 T Gagnon and 18 on 6/6/2007 F. Model. Silvery Blue is an obligate univoltine throughout its range, and overwinters as a pupa. According to MBC records, the flight in Massachusetts lasts from the first week in May through the end of June, with the greatest numbers flying from the last week in May through mid-June (see http://www.naba.org/chapters/nabambc/flight-dates-chart.asp). Latest sightings: In the same 21 years the dates of late sightings are quite variable, but hardly any extend into July. The two latest come from NABA Counts: 7/12/1997, North Berkshire Count, and 7/10/2005, Northern Worcester Count, and may be mis-identifications. The four latest non-NABA-count reports are 6/30/2003, Harvard, T. Murray; 6/22/2013 Williamsburg C. Duke (photo); 6/22/2008 Newbury Martin Burns WMA, S. Stichter; and 6/21/2002 Windsor Moran WMA M. Lynch and S. Carroll. In eastern North America, the Northern Silvery Blue is a northern-based subspecies, and Southern Silvery Blue is a higher-elevation subspecies. Neither has any current southeastern seaboard range. This species as a whole is likely to be negatively affected by climate change (Table 6), and may well pull back from its recent expansion into New England. Climate change appears to be the main threat to Northern Silvery Blue in Massachusetts. In other respects the species appears to be quite adaptable (Cech and Tudor 2005), using disturbed areas such as lightly-mowed fields and roadsides if the larval host plants are present. Northern Silvery Blue has adopted a number of new hostplants, and cow vetch (Vicia cracca), in particular, is common and widespread throughout Massachusetts. In meadows and roadsides, light mowing only once or twice a year is recommended to preserve habitat for this species.